Fresh twist on folk rock; Sarah MacLachlan meets Beth Orton and they fiddle with the blues. Take one part excellent songwriting, one part stunning vocals, mix in guitars, keyboards, strings and a wicked harmonica. 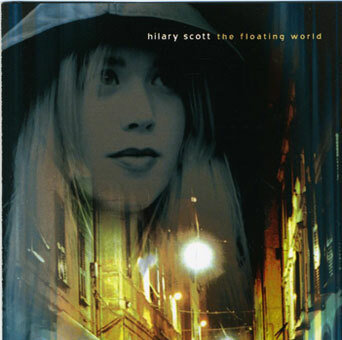 Pieter from Holland has this to say about The Floating World: “Great album, especially the lyrics and soulful music/ Hilary puts us in an emotionally-bound atmosphere where you only can listen to her music. Good glass of wine, candlelight or anything else which gives you romantic feelings”. A musician since the age of three and a writer since the age of five, it seemed natural that Hilary would one day combine the two, and the result is explosive. Raised on piano, violin, voice and guitar, she experiments with different sounds, instruments, and styles to create unique audio artwork. Her influences when she were growing up were vast, but she felt a special connection to the music of Peter Gabriel and Nick Drake. From Peter Gabriel grew her passion for percussion and orchestration, and from Nick Drake came her love of honest lyrics and heartbreaking guitar melodies. Female artists she has been compared to include Sarah MacLachlan, Ani DiFranco, Melissa Ferrick, and other modern songwriters. Listeners can be gratified with blues, folk, rock, pop and classical influences in her music, and yet still find they are listening to something completely fresh and difficult to define. “…I was completely blown away by Brook’s opening band. Hilary Scott is amazing, and I hope to see a lot more of her and her band in the future.” -Taken from the Blue Note website. “…rich and introspective lyrics…the maturity of Scott’s music is what is most impressive about her album…full of real emotion and reflection…” – Liz Van Hoosen, Columbia Daily Tribune.